The Pellet Transport System PTS from Optical Control systems, is a continuous and automatic transportation of pellets between the production lines and measuring systems. 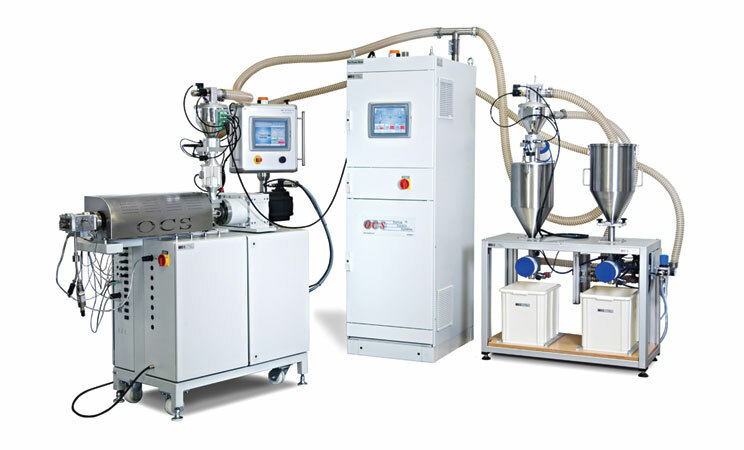 Samples of pellets from the production line are affected by means of pneumatic sample takers. Samples are sent through aluminium or stainless steel pipes (shot peened option). The PTS consists of hopper loaders (Cyclone) with shutter valves for extruder with low and high level sensors for sampling. Furthermore a stand by tank for purge and calibration material and a 3-way switch for a starvation system is available. The PTS is controlled with a PLC which is driven with a TFT touch panel for visualisation and control of the sampling system. The system is equipped with a digital I/O interface to the DCS for transferring status and alarms. All Pipes and bends (elbows) are specified to avoid dust, angel hairs and streamers. Totally gap-free flange connections (recommended: Slip-on collars and loose flanges with projection and recess). A de-dusting device for removing dust and streamers etc. is an option. Sample taker, 3 way switch and special hopper for extruder consist of Hopper loader (Cyclone) with shutter valve for the analyser with low / high level sensors for sampling.